Yum, lowfat cookies! These are an "okay" yum--not an OMG yum--but they are perfect for satisfying those chocolate sweettooth cravings when you don't want to worry about the calories. They are rather rich in flavor: the amount of cocoa powder in the batter really packs a punch, but the cookies aren't terribly sweet (although they are sweetened with both brown sugar and corn syrup). In fact, the texture and taste are sort of like a thick, fudgy brownie. Chopped pistachios and dried cherries are prevalent throughout each cookie. The tartness of the cherries goes nicely with the rich and sweet chocolate, and the pistachios are there to add some nice crunchy texture. These cookies are easy to make, but one note about the baking time: the recipe suggests 10 minutes (to keep the texture) but I would recommend closer to 15...otherwise, they will be TOO soft and half of the cookie will stick to the baking sheet. 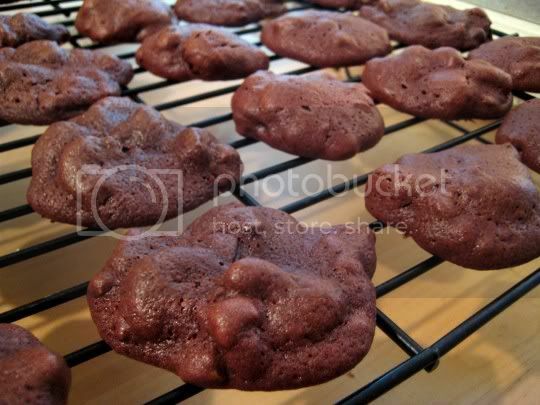 Leave them in a little longer for a slightly firmer cookie, but they will still be fudgy and soft in the middle. Make again? Yes. Chocolate and cherries are always a winning combination.